Are you still looking for a gift? Well, I always like to give gifts that I would appreciate and use; that’s where Gerber comes in. Gerber has released the Artifact Pocket Keychain Tool which retails for around $10. The Artifact features an exchangeable / removable #11 hobby blade, cross driver, small and medium flat drivers, wire stripper, pry bar/paint can opener and lanyard/keychain attachment hole. It is a great gift, that will actually get used! 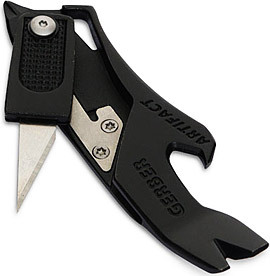 This entry was posted in Gifts and tagged Artifact, Gerber, Tools. Bookmark the permalink. Oh, it will get used… and it will get you arrested at the airport when you forget to take it off your keychain!